by hundreds, if not thousands, of years, these skills tended to disappear with the development of looms. As cultures gained proficiency in the art of loom weaving, the craft of braiding and plaiting became less and less valued. Historically practical structures, braids were typically designed for specific uses and purposes. Little documentation exists about the forms and uses of the earliest braids because they have always been considered 'secondary textiles.' Undoubtedly, many cultures sought to enhance their daily life with braids that were beautiful as well as useful, but beauty was secondary. The information we have today comes almost exclusively from preserved braid pieces, often attached to clothing or with objects preserved in temples, shrines and graves. Three continents, the North and South Americas and China, have strong historical braid roots. The earliest braids found to date have been in the high, dry Andean Highlands of South America, which have proven a good repository for braids and other Peruvian textiles. Similar, but distinctly different, flat, finger-woven braids are known from the Basketmaker period of North American Indian history. The silk braids known as kumihimo developed in China, but travelled great distances and gained identity in Japan, rather than China. Each of these three very different and very distant cultures developed braids unique to, and characteristic of, that particular culture. 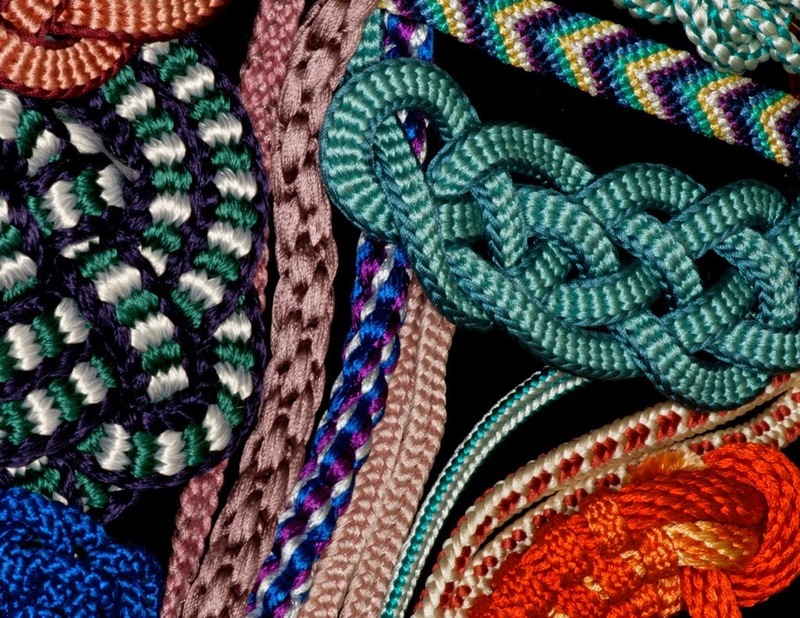 The flat, finger-woven braids of the North American native Americans and of the Peruvians share a commonality, but are readily identifiable one from the other by patterns and designs. In addition, the round braids made entirely in hand by Peruvians even today share a common structure with many of the round Japanese braids—but are distinctive in materials, patterns, and uses. *An excerpt from the historical introduction of Charlene Marietti's practical workbook, "Kumihimo: A Systematic Approach to the Ancient Art of Japanese Braiding."